I was raised on a farm in Fair Play. This summer I married my high school sweetheart, Jake, and moved to Bolivar. We have an English bulldog named Max. This summer I became an aunt for the first time and enjoy spending my time with her and my family. I graduated as an Expanded Functions Dental Assistant from OTC in 2016. I did my externship with Dr. Bauer and knew if a job opportunity opened I would apply. Dr. Sara hired me as a hygiene assistant shortly after I graduated. 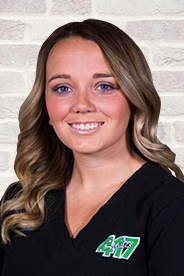 I love helping the community achieve happy and healthy smiles with the best dental team.